The words ‘Chinese’ and ‘quality’ are seldom used together. But things are changing. 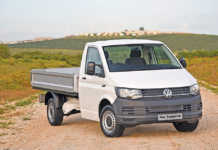 And if you had doubts about Chinese bakkies, the new JMC Vigus will dispel them rapidly, says Chris Nel. The attractively sleek lines of the JMC Vigus are similar to those of the latest Japanese bakkies. 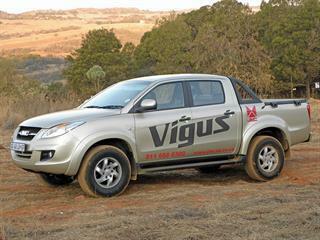 To anyone accustomed to the previous generation of Chinese bakkies, the JMC Vigus will be a revelation. The message it delivers is straightforward and simple: the Chinese are here to stay and the competition will have to get its act together. That said, it is difficult if not impossible to properly evaluate any vehicle without living with it and driving it for at least six months on a variety of roads under different weather conditions and carrying various loads. But such an opportunity seldom comes around in our frenetic world. So what is written here must be read against this caveat. The vehicle I was offered to test was the top-of-the-range JMC Vigus 4×4 MT SLX Double Cab. Not having driven a Chinese bakkie for a few years, I was surprised to find that it had most, if not all, the standard features and accessories found in equivalent 4×4 double cab bakkies from other manufacturers costing a great deal more. These include air conditioner/heater, an excellent sound system, electric windows, central locking, and a rotating dial with warning lights selecting 2H, 4H and 4L ranges. An array of warning buzzers and lights inform the driver and passengers should someone do something they are not supposed to, such as fail to fasten a seat-belt or not close a door properly. This is all well and good and user-friendly, but such features add to the complexity, cost and maintenance of a vehicle. I suppose, though, that this is what competition and evolution in vehicle design and manufacture inevitably leads to. The seats are attractive, well designed, very comfortable, and warm in cold weather and cool in the heat. An excellent feature for this type of vehicle is the floor covering – a smooth, waterproof, flexible and highly durable heavy-duty vinyl. Dust, dirt and burrs are easily brushed off, while simply wiping it with a wet cloth removes all traces of anything else, including mud and cattle dung. This is a great benefit for the farmer who has neither the time nor inclination to engage in carpet deep-cleaning should he step into a cowpat or black cotton turf before climbing into the vehicle. The lines of the Vigus, like those of its Japanese competitors, are clean, smooth and uncluttered. The aerodynamic design helps to keep drag and wind noise down, and promises the same for fuel consumption. The fitting and joints between panels is up there with the very best in the industry. The build quality is solid; the doors close with a muted thunk and sound proofing is exemplary. Integrated in this clean design is a purpose-designed cab protector bolted onto the top edge (sides and front) of the loading bin. This is in contrast to the traditional Heath Robinson afterthought type of cab protector (or ‘roll bar’) still found on most bakkies that never seems to seal the tonneau cover properly against dust and water. The Vigus’ cab protector does not compromise the loading area in any way. Elegant, clean and uncluttered, it keeps wind drag to a minimum and incorporates a reasonably water- and dust-proof tonneau cover. This has a stretchable bolt rope sliding into an aluminium extrusion channel incorporated onto the front and sides of the cap protector. The design lacks the traditional lateral top projections over the cab that prevent long objects from sliding sideways. Instead, it cleverly enables these to be easily lashed down and secured onto sturdy polymer lashing anchors on the lateral edges of the cargo bin by rope or heavy bungee cord. Another plus is the high-quality polyurethane lining of the load bin and inner tailgate surface. When applied in place of paint instead of as an afterthought over paint, such a lining is far more durable and lasts longer. This should be a standard feature in every bakkie sold in South Africa. Light, attractive and reasonably sturdy plastic bumpers should last well if the bakkie is used responsibly, less well if used recklessly. For such drivers, there should be plenty of scope for aftermarket steel bumpers should this be necessary. When opened down flat, the tailgate unfortunately covers the bumper step, making it difficult to step onto the load bin when loading heavy and bulky objects. The 68l tank promises decent range between refills. I tested the fuel consumption on a 360km trip in Gauteng: 310km were on tar, mostly motorway, and 50km were on rough rural roads near Tierpoort. I used 32,7l of fuel for the trip, giving a consumption figure of 11,01km/l or 9,1l/100km. Ride and handling were up there with the best of the type, even on a badly rutted and corrugated section. The four cylinder 2,4-litre JX4D24 turbo diesel engine delivers 88kW at 3 000rpm to 4 000rpm, and 290Nm torque at 1 800rpm. It operates perfectly on the more widely available and less expensive 500ppm sulphur diesel. The engine has ample usable power for any sane driver sticking to the speed limit. But pull away carefully when unladen on a loose gravel surface, as it’s all too easy to spin the driving wheels. 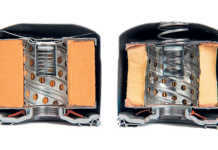 The engine compartment layout is excellent, with all critical and service components easily accessible. A clean and uncluttered underside, with bias-mounted telescopic shock absorbers on the rear axle reminiscent of the Toyota Hi-Lux, reduces the chance of scraping on a rock higher than the 225mm ground clearance. The alloy wheels are shod with Maxxis Bravo 750 (R285/70 R16). 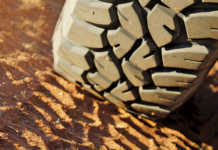 Offering good grip and shock absorbing ability, this dual-purpose tread (road and off-road, with a bias to road use) is a good choice for this type of vehicle. The Vigus can also be ordered new with tyres of the buyer’s choice. The tool kit includes a fire extinguisher for Class A, B, C and E fires, with ammonium phosphate powder as active ingredient. The capacity is around 2,5kg or 3kg judging by size; my Chinese is not that good. The warning triangle, along with the two-piece rod that engages the wheel-nut spanner to turn the chain mechanism lowering and raising the spare wheel from beneath the rear of the load bin, reside in a neat pocket under the rear seat, accessible by tilting the seat forward. The 2t telescopic hydraulic jack is superior to the scissors-type jack supplied with some other bakkies. It engages on two jacking points either side of the chassis frame between front and rear wheels, and must first be extended to take up the suspension travel and then further before the wheel leaves the ground. The jack extends in two stages to provide a total lift of 215mm, the first ending at 38 strokes, the second at 55 strokes. Lowered, it is 175mm high; extended, it is 390mm. The jacking point is a bit awkward. Because it is under the axle, you have to worm your way in under the vehicle, jack in hand, to position it properly. On wet, muddy, stony or thorny ground, this will expand your vocabulary remarkably. To play it safe, I would carry a heavy canvas mat and a stout wooden board to serve as a jacking base for this type of jack. To summarise: this is a capable, comfortable, balanced and well-built vehicle that can hold its own in the best company. It comes with a three-year 100 000km guarantee, a five-year 60 000km service plan and 24-hour roadside assist. The price of R375 990 makes the Vigus an excellent buy.